The origins of this engraving are somewhat uncertain. It appears tipped into a copy of Oswald Croll's Chymisch Kleynod (Chemical jewel) of 1647, though not into all copies. It may have been taken from another work, but it is clearly of that period and of alchemical import. It is centred on a Virgin-like form standing in a nimbus of light and upon the crescent moon. She wears a crown and carries a sceptre. Above her head a cherub sounds a blast on a trumpet which emits the phrase 'The sounding out of life'. She would appear to be a Queen of Heaven having power over the fecundity of living things, thus she carries the vine with its bunch of grapes. In her right hand she holds a set of twelve keys. These are likely to be the keys to the twelve zodiacal signs which rule the seasons and thus the growth of plants. Around her head are the seven planets. Power takes refuge in the new life itself. Our heavenly Queen looks down to the strange tree on the left. This grows out of a crescent Moon and has a sunflower as its flowering head. On the stem of this plant are six starry nodes, from which sprout twelve branches. Each of these terminates in a skull flower and these are labelled with the signs of the zodiac. This tree with twelve plus one flowers is seen in the early Buch der heiligen Dreifaltigkeit and was later used in the important Rosarium Philosophorum series. 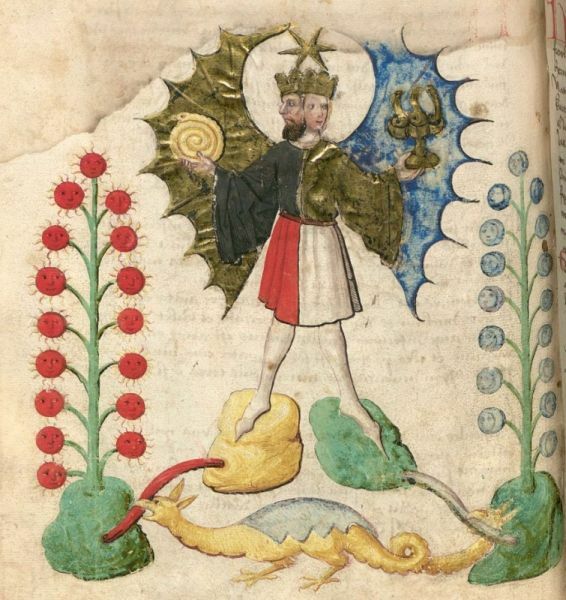 This is a similar image found in the Munich manuscript ( CGM 589) of the Buch der heiligen Dreifaltigkeit. Here the central figure is an hermaphrodite, and the number of flowers is not exactly the same - these do vary in the different copies of this manuscript. This emblem can be read in an entirely different way from the Croll engraving, but the borrowing of images from it is obvious. 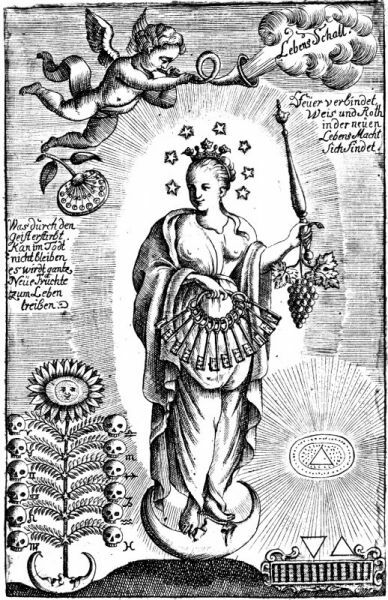 Here is the similar woodcut from the 1550 printed version of the Rosarium Philosophorum. Again following the Buch der heiligen Dreifaltigkeit we have a central hermaphrodite standing on the lunar crescent. In this case the flowers are all Moon-like, though there is another image in the series with solar flowers. The colouring is my own. 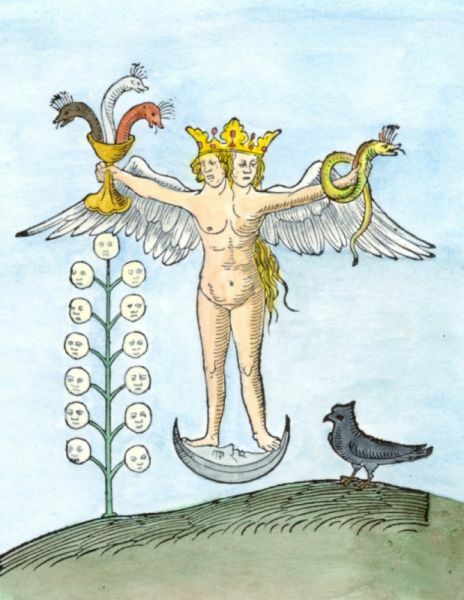 We will take a look at the various appearances of hermaphrodite in alchemical emblems in a later discussion.